The authors of ‘Capital as Power’ comment on Ronen Palan’s article ‘Capitalising the Future' (previously posted in August of this year), finding much to disagree with regarding his interpretation of Thomas Picketty's theory that when the return on capital far exceeds the rate of growth of the economy it leads to the concentration of capital in fewer and fewer hands. In an article for New Left Project, Ronen Palan examines Thomas Piketty’s book Capital in the Twenty-First Century. The paper shows strong, albeit unmentioned affinities with our approach. But these affinities are largely superficial. Palan demonstrates little understanding of our approach, and given the article’s many elementary errors and fallacies, we very much doubt he has comprehended Piketty’s. Piketty’s book, Palan argues, is empirically rich and theoretically insightful, but it also leaves important questions unanswered. 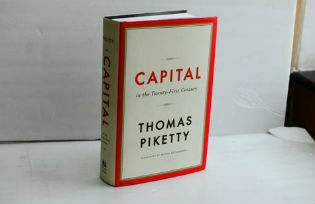 While Piketty shows that the ownership of capital becomes concentrated because the rate of return on capital far exceeds the pace of economic growth, Palan argues, he does not explain why the two rates should differ in the first place, or what the resulting concentration of wealth ‘really amounts to’. To clarify these latter issues, Palan draws attention to two structural elements which, in his opinion, stand at the heart of modern capitalism: ‘futurity’ and ‘leverage’. Futurity, he contends, explains why the return on capital exceeds the rate of economic growth, while leverage suggests that much of the measured rate of accumulation, particularly by the ‘superrich’, is significantly overstated. According to Palan, the gist of Piketty’s theory is ‘extraordinarily simple’: the rate of return on capital r far exceeds the rate of growth of the economy g, and this difference works to concentrate capital in fewer and fewer hands. The basic problem with Piketty’s explanation, Palan contends, is that r and g are in fact totally different creatures. In Palan’s opinion, the growth rate g belongs to the ‘past-oriented’ economy, while the rate of return r derives from the ‘future-oriented’ economy. The two economies, he argues, are fundamentally different, and that difference makes the comparison of g and r ‘unfair’. The past-oriented economy, he elaborates, generates ‘tangible’ assets like real estate, while the future-oriented economy creates ‘intangible’ ones like human capital. And since, in his view, the former assets are valued based on their replacement cost, while the latter are valued based on their future earnings, their comparison is inappropriate. This argument perplexes. Following Irving Fisher, the conventional economic creed is that all assets, whether tangible or intangible, are created in the past; and that all assets, whether tangible or intangible, are valued based on the future income they are expected to generate. To connect these two sides of the world, economists assume that, in a perfectly competitive equilibrium, the cost of producing the assets equals their discounted future earnings. Apparently unaware of this setup, Palan suggests that economists have erred in focusing mainly on past (tangible) assets while neglecting future (intangible) ones. This error, he says, explains why the notion of ‘High Net-Worth Individuals (HNWI)’ is so popular. The term ‘net’, he informs us, ‘refers specifically to [the capitalists’] wealth minus their intangible assets’. Unfortunately, Palan’s definition of net worth has nothing to do with the way in which the term is customarily used. In accounting and finance, ‘net worth’ denotes the difference between total assets and total liabilities, regardless of whether the assets in questions are tangible or intangible. Moving forward, Palan argues that the market value of publicly listed companies like Coca Cola ‘lies somewhere in the future’, being ‘calculated on the basis of what is known as the price-to-earnings ratio’. In our opinion, this claim is both tautological and contradictory to its author’s own assertions. Begin with the market value of a firm. At any point in time, this value is given by multiplying the number of outstanding shares by the ongoing market price of those shares. But, then, since the market value already contains the company’s share price, to say that this value is based on the company’s price-to-earnings ratio is to say that this value is based on… itself! Moreover, according to Palan, it is future earnings that count for valuation, yet the earnings in the price-to-earnings ratio are those received in the past. These minor technicalities aside, why is it so important for capitalists in the new age of ‘entrepreneurial culture’, as Palan calls it, to rely on the future rather than the past? Palan’s answer: ‘The future dimension adds value to businesses: expected income can be factored into current valuation, which will therefore be above the replacement cost’. Or will it? Conventional measures of Tobin’s Q, which calculate the ratio of market value to replacement cost or net worth, oscillate below as well as above 1. This oscillation means that Palan’s ‘futurity’ can undermine as well as boost capitalist assets. Moreover, in the case of the United States, standard measures put the historical average of Tobin’s Q since 1900 at less than 1; in other words, had Palan checked the data, he would have had to conclude that, on the whole, capitalist ‘futurity’ has served to subtract value from businesses, not add to it. The effect of capitalising on the future, Palan continues, helps explain not only the short-term collapse and rapid recovery of wealth, but also the long term ‘chasm that can open up between “wealth” levels and economic growth’ (unlike Piketty, Palan tends to conflate levels with rates of change). This chasm opens up because intangible financial assets (which in his view are limited only by ‘people’s expectations and beliefs’ about the future) expand faster than the real economy (which is ‘strictly past-oriented and limited to tangible assets’). And it is this chasm between the intangible and tangible, he concludes, that explains why Piketty’s rate of return r is far larger than his rate of growth g.
Or does it? First, if asset prices were to continuously inflate relative to their replacement cost, the rate of return on those assets r – computed as the ratio of current profit to future-oriented asset prices – would likely trend downward, bringing it closer and closer to g. Second, roughly two-thirds of modern GDP consists of services; in other words, the ‘tangible’ growth rate g is mostly intangible! For Palan, capitalising the future is only one side of the story. The other side is debt. Piketty’s r is ‘largely determined by a combination of futurity and high leverage’. Capitalists, Palan explains, borrow heavily against their assets (which are already inflated by intangible future hopes), and this leverage, he contends, further – and unduly – inflates their measured ‘net’ wealth and exaggerates the overall accumulation of capital. This claim is hard to digest. As noted, the conventional definition of net wealth is assets minus liabilities, so incurring additional debt in order to purchase additional assets makes no difference to a capitalist’s net position – or to the net position of all capitalists for that matter. This is standard accounting, and that is why Piketty defines his notion of wealth as the sum of all marketable assets less all liabilities. Soaring leverage per se cannot explain changes in net wealth in general and Piketty’s measures in particular. In his closing remarks, Palan states that, ‘there is considerable ambiguity about the concept of wealth and how to measure it’. Although Piketty’s work is ‘clearly of great importance, both intellectually and politically’, he compliments the celebrated writer, that work isn’t enough. ‘If we wish to understand how wealth is centralized, concentrated and deployed,’ he concludes, ‘it is important to understand that the category of “wealth” is not as straightforward as conventionally thought’. But, then, how can we understand this category if we ignore logic and eschew research? Shimshon Bichler teaches political economy at colleges and universities in Israel. Jonathan Nitzan teaches political economy at York University in Toronto. All of their publications are available for free from The Bichler & Nitzan Archives. Piketty, Thomas. 2014. Capital in the Twenty-First Century. Translated by Arthur Goldhammer. Cambridge, Mass and London, England: The Belknap Press of Harvard University Press. Fisher, Irving. 1896. ‘What is Capital?’ The Economic Journal 6 (24, December): 509-534, Fisher, Irving. 1907. The Rate of Interest. Its Nature, Determination and Relation to Economic Phenomena. New York: The Macmillan Company. Nitzan, Jonathan, and Shimshon Bichler. 2009. Capital as Power. A Study of Order and Creorder. RIPE Series in Global Political Economy. New York and London: Routledge, Chapter 10.